Constant flushing of the face, dilated blood vessels, broken capillaries, feeling of tightness, tingling and burning, sensitive and reactive skin are symptoms of rosacea which affects nearly 2 million Canadians between the age of 30 and 50. Rosacea is a chronic skin condition. It cannot be cured but it can be controlled so that it does not progress to more advanced stages. Early diagnosis is desirable in order to better control symptoms and prevent worsening of the disease sometimes causing disfigurement. 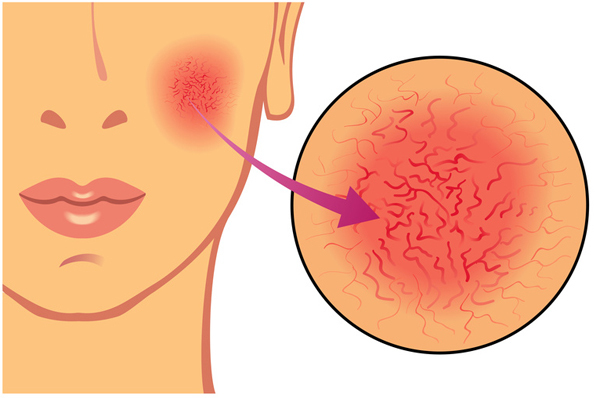 In the early stage , it is called vascular rosacea associated with the presence of dilated and congested blood vessels in the skin. These dilated vessels are the source of all the symptoms associated with rosacea. At first, these vessels are not visible but they cause redness, irritation skin intolerance and over sensitivity to different factors. Then, with time and in absence of treatment, redness persist and become more visible especially on the cheeks , nose and chin. Later, small bumps and dilated blood vessels give the skin an irregular and rough texture. In some cases, when the sebaceous glands and surrounding tissues become swollen, the skin of the nose thickens and covers up with bumps. This advanced stage is called rhinophyma and reached more often men than women. Genetic predisposition plays a big role in rosacea. 30-40 % of rosacea patients have a relative who also developed the disease. People with fair skin are also more affected. We also know that sun exposure, especially to UVA is one of the factors that cause rosacea and on which we have more control with the application of sunscreen. Rosacea cannot go away without treatment. It must be diagnosed by a professional who will recommend the best treatment depending on the skin condition and the stage of the disease. Often, an improvement of the symptoms is observed just a few days after starting the treatment. It is important to treat rosacea in its initial phase in order to prevent progression to more advanced stages of rosacea. Indeed, it is the non- treated vascular rosacea that causes evolution towards rosacea and its related symptoms. Appropriate skin care: we must pay particular attention to skin care when suffering from rosacea. At MédIME, we offer several pharmaceutical grade skin care products which have proven to be effective in the treatment of rosacea symptoms. Vivier Redness Solution Complex, a technologically advanced product helps to calm the skin and reduce redness. Formulated with peptides and red algae extract, it protects the skin against external aggressions and helps regenerate the natural protective barrier of the skin. V-Beam laser and complete ranges of skin care for the treatment of rosacea are available at MédIME. To learn how V-Beam laser and skin care can help treat rosacea, book your free of charge evaluation by completing the online form or contact us at 514 739-7444.